Hines Sight / Ain't she sweet? Wearing a corsage, Frances Hines is surrounded by, from left, daughter Janice, granddaughter Sara, and the author. My family has been rife with strong women. Both of my grandmothers ruled their roosts. Grandma Rose, who came to America from Italy when she was a young girl, struggled most of her life raising nine children and trying to keep a roof over their heads and food on the table. While my grandfather worked at various jobs, Grandma, with no formal schooling, was an entrepreneur. She sold fruits and vegetables from a truck, doing, amazingly, all of the math in her head; she then owned and operated a grocery store, partially because she wanted her family to eat better. After that, she was a landlady, renting the storefront to various businesses over the years, and still later, she did laundry and ironing for some of Southport's wealthier residents. Grandma Hines never held a job, but that didn't make her any less industrious or valuable. She too tended to her family -- which saw better times than my mother's clan -- and to her yard. She also was known to shovel snow from her long driveway on more than one occasion. One year, Grandma, probably in her 80s, decided she couldn't wait any longer for her handyman so she climbed out on the lower roof of the house to wash the second-floor windows. While my grandfather toiled as a builder and then the owner of a lock manufacturing company, Grandma worked the money. For a person with limited education, she could have rivaled any hedge-fund expert today. She was very adept at moving the money around to get the best return. I don't think Grandpa ever knew what she was doing. And then there's my mother -- a force in her own right. Frances Hines had that knack for finances, but more importantly, she was at the center of the family's entertainment. When my sister, brother and I were growing up, Mom was known as the "Tour Director." Although money was tight, she always made plans so the kids and Dad had a vacation, sometimes just a day or two away within driving distance. Most summer days were spent at the beach, where my mother and her sisters and my cousins would gather. We often went to Southport Beach, but buying food from the concession stand was forbidden. Instead, my mother and aunts (all of them determined and strong-willed women) packed several boxes of food. One time, Aunt Kitty brought a whole roasted turkey. Mom planned trips to Candlewood Lake, Lake Compounce, Squantz Pond and, of course, the Catskill Mountains, one of our favorite destinations. But each vacation never seemed like much of one for Mom. In those early days, we packed the car with food, cooking utensils, pots, pans and tons of other stuff. Eating out never was an option, so Mom spent several hours preparing home-cooked meals. I remember one vacation in the Catskills, where we rented a broken-down cabin, Mom made a roast beef dinner and invited the next-door family -- who were even poorer -- to join us. That's the thing about Mom -- she never gave it a second thought to helping someone else. Ever the nurturer, Mom saw us through all those nasty childhood diseases, but beyond that, she often aided another relative. My cousin Sharon lived with us for a time during a difficult period in her own family. Mom never hesitated in having her stay in our home. Mom always seemed to be making some kind of elaborate meal for someone in need. Her sisters, recovering from illness or some other bad times, would find Mom at their doorsteps with boxes of warm food. She extended that kindness to friends too. Mom worked at various jobs while she raised the family. She was a secretary, worked at Bradlees department store on the night shift, was a study-hall monitor at Darien High School and had a stint as an assistant to the teachers in the math department at Saxe Junior High School in New Canaan. She wanted to be a nurse but never got her chance after graduating from Roger Ludlowe High School, even though she was enrolled in the nursing program at one of the hospitals. But, more than anything else, she wanted to be an entertainer. She did sing with a Westport Senior Center group for some time and was a member of the cast for a musical in Weston that commemorated the town's history. She and my father often delighted family and friends with their rendition of Arte Johnson's and Ruth Buzzi's skit from the old Laugh-In show. More important than anything else, Mom always was there for us. She is our greatest supporter. She often was the one to whom we turned for advice, and she was a willing confidante. She has helped all of us financially, usually saying, "If I've got it to help you, I'm happy to do so." Mom is now 85 years old, and age has slowed her down some. 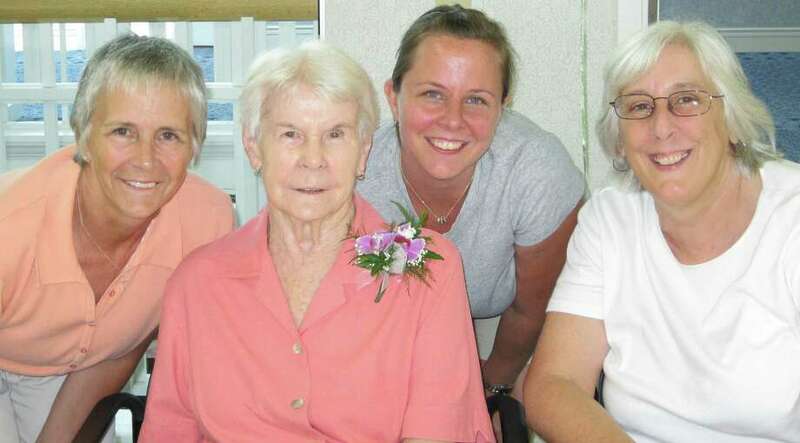 She resides at an assisted living facility, partaking in as many activities as she can do in a day. And she still entertains. This past Valentine's Day, she sang a variation of "Ain't She Sweet" (her signature song) to all the men at her residence. "Ain't They Sweet, See them walking down that street. Yes I ask you very confidentially, Ain't they sweet?" Needless to say, the men loved it. Although Mom has had to deal with the loss of my father and with some health issues in the last five years, she perseveres. Roles are somewhat reversed now, with my sister and I handling Mom's finances and seeing her through medical obstacles. It's the least we could do for someone who cared so well for us, worried about us, raised us to be decent people and who asked for little in return. I suppose a phrase she is fond of saying has truer meaning than ever now: "Remember who you are and where you came from." Patricia A. Hines is a Fairfield writer, and her "Hines Sight" appears every other Friday. She can be reached at hinessight@hotmail.com. She also can be followed at http://blog.ctnews.com/hines.